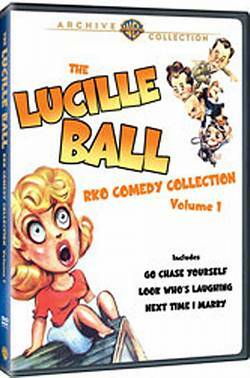 It was announced that The Lucille Ball RKO Comedy Collection, Vol. 1 will be released 9/26/11 on DVD with three movies on it not previously released. (That's good!) Carol Meeley (Lucille Ball) is the wife of a dimwitted bank teller (Joe Penner) who finds himself accused of collaborating with a gang of robbers. Carol's only hope of clearing her husband's name is by proving he's not nearly smart enough to be a criminal, in the comedic caper "Go Chase Yourself" (1938). With Richard Lane, June Travis. Next, in order to claim a $20 million inheritance, Nancy Crocker Fleming (Ball) simply hires a temporary husband (James Ellison). But their cross-country trip to Reno for a quickie divorce leads to a series of comedic-and romantic-entanglements, in "Next Time I Marry" (1938). Lee Bowman, Granville Bates co-star. And, some of the greats of radio comedy team up for the frantic farce "Look Who's Laughing" (1941). Edgar Bergen and Charlie McCarthy land their plane in Wistful Vista, home of Fibber McGee and Molly, and decide to build an aircraft factory there. Ball co-stars as Bergen's secretary; with Harold Peary, and Jim and Marian Jordan. Standard; Soundtrack: English Dolby Digital mono. Two-disc set. 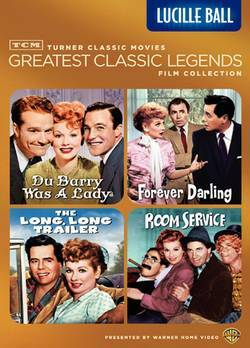 Greatest Classic Legends Film Collection: Lucille Ball - "Forever Darling" (1956) stars Lucille Ball, who begins to feel neglected by her workaholic chemist husband, Desi Arnaz. When Ball wishes for more attention from her spouse, her guardian angel (James Mason) appears and warns her of trouble unless she can take more of an interest in him. When Ball accompanies Arnaz on a camping trip to work matters out while he tests an insecticide, hilarious catastrophes ensue when everything goes wrong. Two-disc set also includes "Room Service," "Du Barry Was a Lady," and "The Long, Long Trailer." 6 hrs. total. Standard/Widescreen (Enhanced); Soundtracks: English Dolby Digital mono, French Dolby Digital mono; Subtitles: English (SDH), French, Spanish; theatrical trailers; bonus footage; bonus shorts "Party Fever" (1938), "The Daffy Doc" (1938), "Seeing Hands" (1943), "Bah Wilderness" (1943). "Ain't It Aggravatin'" (1954), "Dixieland Droopy" (1954). This morning Nelsa, Doris' sister (these are friends in the neighborhood) gave me a ride over to the Walmart at 88th Street in Jersey City. I always went to the one in South Kearny, NJ. I didn't know about this one. This one was in a shopping center with a Petsmart and a Target and a few other large stores. This one was HUGE!!!! It was just as big as a Wegman's with a large produce department, a large arts and crafts department and large sections of stuff all over the store... Oh, and a large frozen foods section with packages of PF Changs frozen food that I haven't seen in stores since mom took me to a Target in Balto months and months ago. (I love PF Changs Chinese food) So- I got my two boxes of Scoop Away® cat litter and a large bag of Cat Chow®, a few cans of Friskies®, A few frozen food things, delicious Peperoni and Cheese Rolls & Garlic Parmesea French Bread. Ooooh, is that good!!! I found it, I found it, I found it!!!!! I've been looking for this for a long time ever since I met Richard Skipper in the mid eighties. I drew this back in 1973 when I was in art school for illustration. 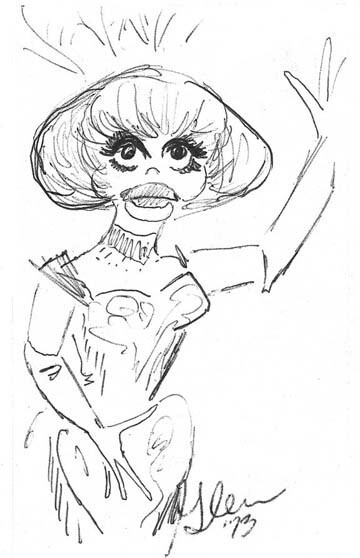 I was at lunch with a friend from class and I was talking about Carol Channing. This person didn't know who I was talking about. I said she was famous for the Broadway musical "Hello, Dolly!" and he still didn't know her, so I drew this for him and then he knew exactly who I was talking about. Pictured is a scan of the original napkin drawing. Didn't really have much happening this week. Today is Lucies birthday... 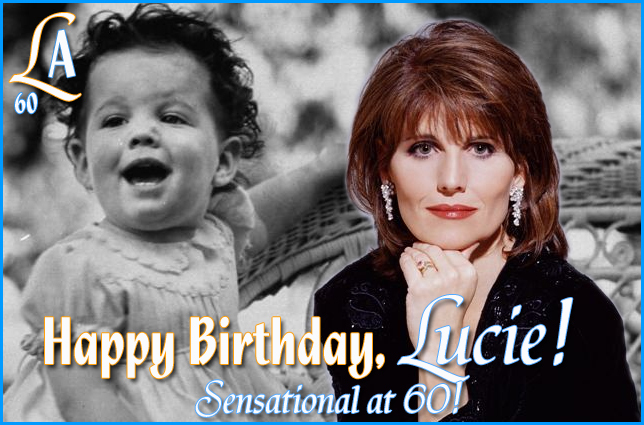 Happy Birthday to Lucie Arnaz Luckinbill. When I was looking for an appropriate video to put here that showed something Lucie did or is doing or whatever... I found this made to celebrate her birthday last year. I thought I'd just put it here. The pics down the side I took at her performance at Barnes & Noble last year in May. This is the start of what I hope to be a weekly blog. Since this is the first entry, it covers July 1st through the ninth. That's a week and a few days. But after this, I will make it a point to enter the happenings of every day from the week past. Friday July 1- was a sad day for me as my car was towed away after I sold it for junk to CAR-TECH AUCTION, INC. The funny thing about this is... after the car was hit, it sat there on the street for about three and a half weeks before anything was done. Then, today, the truck operator gets into the car, starts it up and litterally drives it out of the space and onto the flatbed truck that would tow it. Driving on the flat tires and all. I mean, I knew the car started and I never tried moving it because of the flats. But I think now, if I had the flats fixed, it may have been drivable. But ya never know how bad the alignment would have been or if because of this accident the frame could have craked and I wouldn't know it till I was dead. Tuesday July 5-, I took the car license plates to the DMV to return them but the line was so long coming out the door that I decided to go away and come back another day. Wednesday July 6- I recieved the papers from Esurance Insurance Company with the figures on what they will offer me to settle this whole car matter. I weighed it against what my own insurance company (AAA) offered me already 2 weeks ago. Oh, what to do? Thursday July 7- I was on the phone back and forth with agents from AAA trying to find out once and for all how my stupid $2000. deductible would play into this and whether or not I would get any of it back. After Ms. Rizzi-the woman who wrote up my policy told me that the extra amount not recovered from Esurance can be covered by the underinsured/uninsured section of my policy I thought I would just simply go with them. Because then AAA would act on my behalf with anything that had to be done in recovering the money from the other company. Someone later that day from AAA told me no, that's not for collision, it's for Medical. I argued with them saying this was not medical. Why would Ms Rizzi even mention it to me if it were medical coverage when she knew the specifics of this accident and knew nobody was injured in it. Medical coverage had nothing to do with it. This person will check with Ms. Rizzi to see what she told me and call me tomorrow morning. Friday July 8- I got the call from David Maturi of AAA claims and he told me, YES, that underinsured/uninsured part of my policy can be implimented in this case and I would then get back all but the $500. deductible that this part of the policy has. That total would be $57.85 less than the total figure offered to me by Esurance. I just may go with them. I left home for lunch with the folder in hand to get the Property Damage Release form from Esurance Insurance Company signed and notorized to be paid for damages from them rather than go thru my own insurance company where any deductibles play into the final amount. And of course I want to get as much out of this as possible. And it's $57.85 more than if I went with AAA. Got home, prepared and copied the documents and folded them into the envelope for mailing directly at the post office tomorrow morning on my way in to NYC for Broadway Barks and a gathering for someone's birthday at Richards later in the evening. While Mikey and I were on the phone tonight, he reminded me to go to MyLITV.com to check and see if that interview with Lucie was there... sure enough... it WAS. Exactly what I suspected... "I" was not in the video at all. In fact, I'm behind the back of Eric Schwarz' head which is prominant in the foreground and if ya didn't know I was next to Mikey, you wouldn't be able to tell I was there at all. 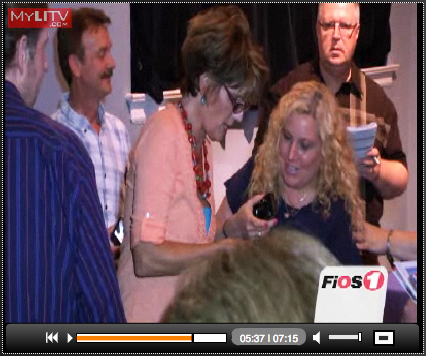 But I know where I was standing in relation to the camera angle and I'm in the shot a split second. Here are a few stills from the video. See... Mikey is right there next to Lucie. I knew my interview wouldn't be in it because I couldn't think of what I was saying and it probably came out all wishy washy. So they didn't use it. That's okay. Saturday July 9- It was Broadway Barks day in Shubert Alley. I went for just a little bit between 3pm and 5 pm. Then I left to get on the train to go uptown and meet with Pat & Joe for a ride to Richards for a birthday party. Disney’s ABC has sold the online rights to the two canceled sudsers as part of a deal with media company Prospect Park, the New York Post reported Thursday. As part of the deal, “All My Children” and “One Life to Live” -- which are due to wrap in September and January, respectively -- will pick up where they left off on a new, still untitled online TV network once they've ended their run on ABC. The show's cast and crew will make the transition as well. The soaps are expected to be the first of a number of brand-name TV shows to eventually land at the site. Prospect Park is lead by ‘Royal Pains’ executive producers Jeff Kwatinetz and executives Rich Frank, who is also a former Disney Studios executive. An email to ABC seeking confirmation was not immediately returned. [Updated at 10:55 a.m.: ABC sent out an official release confirming the "exclusive multi-year, multi-platform" deal. The programs are said to continue in the same format and length. Additional details of the new productions will come from Prospect Park. “We are privileged to continue the legacy of two of the greatest programs to air on daytime television, and are committed to delivering the storylines, characters and quality that audiences have come to love for over 40 years," Frank and Kwatinetz said in a statement.